Heading out to CicLAvia on Sunday? The route from Boyle Heights to East Hollywood will be completely shut down to cars and completely open to bikers, skaters, rollerbladers, unicyclers, joggers and walkers from 10 am until 3 pm. We&apos;ve got a round-up of how to get there, what to do once you&apos;re there, what to eat and drink and where to party afterwards. There&apos;s plenty to do on this car holiday. You can marvel at the architecture. For some background, pick up a hard-copy of CicLAvia&apos;s guide at any of the hubs or visit Militant Angeleno&apos;s guide. You can check out a nearby photo exhibit. You can play bike polo in Little Tokyo. Streetsblog has a round-up of what&apos;s going on near the Boyle Heights hub, including free silk screening at 4th Street and Boyle Avenue put on by one of our favorite groups the Ovarian-Pscyo Bicycle Brigade. The Orange County Bicycle Coalition is "adopting" 3rd and Alameda. And the newly-formed Los Angeles Walks will be hanging out at the corner of 7th and Broadway. There are even more events and intersection "adoptions" listed at CicLAvia&apos;s own page. LA Weekly has a round-up that includes some of the food trucks that will be out. You could ride in with one of the many feeder groups coming from around town. You can start in East Los Angeles or South Los Angeles. Eastern Group Publications has a round-up of starting points for bikers coming from the San Gabriel Valley and other points around the Eastside. Street closures will impact Metro Bus routes beginning 9 a.m. until approximately 5 p.m. Sunday afternoon. 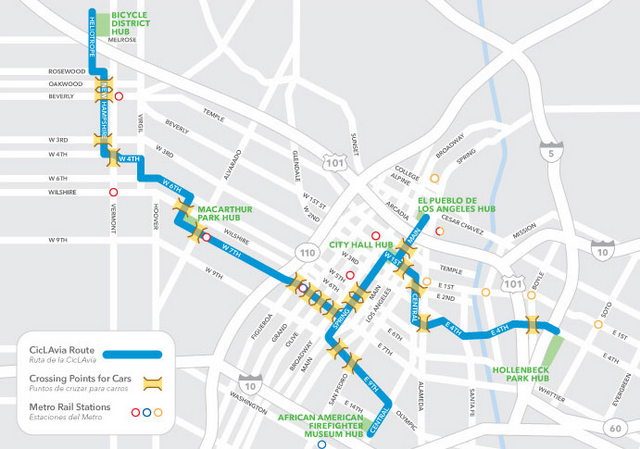 Metro bus lines impacted by the CicLAvia route are: Metro Line 2, 4, 10, 14, 16, 18, 20, 26, 28, 30, 33, 37, 40, 42, 48, 51, 52, 53, 55, 60, 62, 68, 81, 83, 84 , 90, 91, 92, 94, 460, 487, 603, 720, 733, 760 and Metro Silver Line. Metro patrons should anticipate bus detours and delays to service, as well as the temporary relocation of bus stops along the route. Temporary stops will be located as near to original stops as possible. If you do bring your bike aboard Metro, check out this video with tips from Metro. Some free bikes will be available once you get there. Chinatown is hosting its first annual Springfest that kicks off at noon and goes on until 8 pm. There will be beer, food, music and art. Editors note 04/13: some of the links originally posted in this article pointed to information from last year&apos;s event. We regret the error! The links have been corrected, and while we were at it, we added a few more events, too. If you have others, drop them in the comments!